Everest Base Camp Helicopter Flight Landing tour is the best selling helicopter tour package in Nepal to see the Mount Everest in close up view. The helicopter flight either lands at Base Camp or in Kalapathar top. Flying over the Himalayas and enjoying the views of world’s highest mountain like a bird is possible by helicopter flight. A scenic mountain flight by a helicopter on charter basis gives the immense opportunity to explore the world’s mighty Himalayas, landscapes and glaciers. Everest Base Camp Helicopter tour with landing at Kalapathar hill is the world’s best helicopter riding tour. The helicopter flight starts from Kathmandu, domestic sector of Tribhuvan International Airport (TIA) and lands at the Kalapathar hill after the fuel surcharge in Lukla. Flying towards the eastern part of Kathmandu, helicopter flies over the village, agricultural farm lands, jungles, rivers and hills. It takes about 45 minutes for helicopter to reach the Lukla airport heli pad. After refilling the fuel, helicopter flies to Syangboche top at 3800m from sea level. The pilot balance the weight about 250 kgs of people inside the chopper and flies to Kalpathar which takes about 15 minutes from Syangboche. The helicopter follows the Himalayas upto the Everest Base Camp. During this time, you will enjoy the vistas of Mount Everest, Lhotse, Nuptse, Makalu, Amadablam, Pumori and other several mountain peaks. After landing the helicopter at 5400 meter at Kalapathar, you will have 5 to 7 minutes for photographs and sightseeing. You will enjoy the closeup views of Mount Everest, Lhotse, Nuptse and Pumori mountains. After the photo sessions, you will return by helicopter to Syangboche where you will have breakfast and tea-coffee break. Hotel Everest View is the world’s highest 5 star hotel at the elevation of 3800 meter and offers the panoramic views of Himalayas. The helicopter flies back to Kathmandu and ends the Everest heli tour. The trip cost for the Everest Base Camp Helicopter tour varies of the tour type. Private charter flights offers the cost as the total flight cost for your entire group. All your flight is private ad the helicopter flies for you. The maximum number of persons per flight is 5 pax in a single helicopter. Another way to joining the Everest BC heli trip is on the group joining basis. We have fixed departure flight date for the Everest Base Camp. If you are single or couple and want to share the total cost of the helicopter by joining other, you can fly with other interested people on same flight. The group size is maximum 5 persons per flight and cost is on the sharing basis of total charter cost per head. Normally helicopter flights in Nepal charges US$ 1500 per hour. It takes about 3 hours for Everest Base Camp Heli Tour, so the charter cost per flight is US$ 4500 for max 5 persons. If you are lucky and the group joining flight has 5 members, then your per person helicopter tour cost is just US$ 900. Otherwise the cost might be bit expensive. Helicopter flights needs clear visibility. Also you want to enjoy the vistas of mountain by helicopter, so clear sky is the most important for helicopter tour. In Nepal monsoon season it rains heavily and in winter the snow falls in the mountain. However the flight can be possible by checking the weather conditions. The best time for the helicopter tours to Everest is spring and autumn season. Spring season falls in March, April and May and autumn season falls in September, October, and November. Helicopter tour is possible during the year around but for the clear views and visibility, March – May, September – Early December is the best time. In the month of December, January, and February are the possible flight time. In the best months, the helicopter flight early in the morning around 6 am from Kathmandu to Everest is consider as best time for sunrise views over the Himalayas. The helicopter flight is possible within the day light. It completes before the sun sets. The tour itinerary can be change or schedule as per your requirement. The following things are suggest for the helicopter tour to Mount Everest. High protection factor [20 or higher] or high altitude glacier cream due to thin air the U/V is stronger in the sun. For the group joining helicopter flights, check the fixed departure dates schedule for the flight and the available seats. A flight can take upto 6 persons from Kathmandu. Normally 5 persons are comfortable in the helicopter. So check the flight schedule dates with local helicopter tour operators. If the time is similar with other travelers, then you can join in the date. Also you have plan for the helicopter tour earlier than a month, you can offer for the other people to join in your date. Group joining helicopter flight is best for sharing your total charter cost. If you are in group then charter flight for your own group is the best. To make your tour guarantee departure, you must book your heli tour earlier with agency. Helicopters in the busy tourist season are difficult to arrange for your flight. So plan before a week and make your helicopter tour booking confirm for your date and time. It is compulsory to confirm your fight schedule for your heli tour. 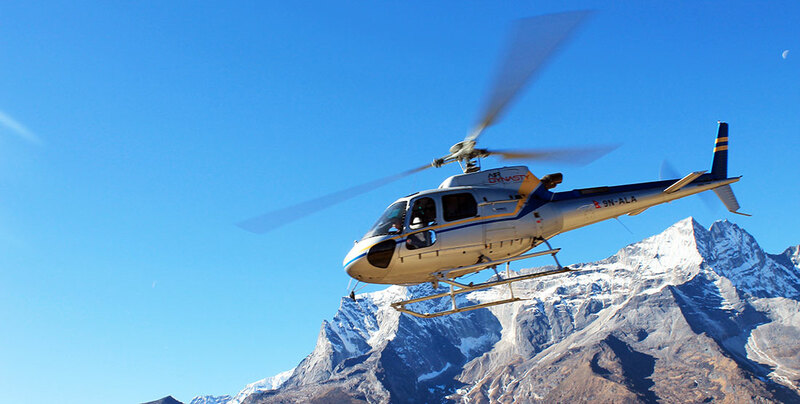 Two type of helicopter is use for the Everest helicopter tour. All these helicopters are run by private companies. The AS350b3e/ series of helicopters and MI seventeen helicopter. AS350b3e series helicopter are manufactured by Euro copter, France and are very popular all over the world. This model helicopter are suitable for mountain flights and rescue purpose. Can fly up to an altitude of 23,000 feet or above 7,000 m.
Never leave the assigned seats during board. Do not change or stand from your allocated seat because sometime pilot need to re-position the helicopter even after touching down the helipad. Do not throw any objects from the helicopter during the flight. For trekkers who want more flexible flight with their price charter, the Kathmandu to Lukla helicopter flight is optional choice. The charter helicopter flight cost is shared with the total flying members in the heli tour. So Lukla flight by helicopter ride is wise choice for trekkers or any other persons with excellent views of Himalayas and landscape. Helicopter KTM to Lukla keeps your schedule of trekking tour by flying even the flights to Lukla becomes cancel. Everest Base Camp helicopter flight with landing at Kalapathar or base camp is the world’s best heli tour to explore the Himalayas. The tour is best in clear visibility and weather. Additionally the helicopter flight is totally depends on the weather, so may or may not fly on time. The flight is on private charter or group joining both tours are similar on cost but the paying calculation per person group joining trip saves your tour cost. The tour by helicopter is your lifetime memorable to see the world’s highest mountain in close-up.